Preheat oven to 200°C/390°F. Peel and finely dice garlic. Grate ginger. Zest and juice lemon. Wash chicken breasts, pat dry, and cut into bite-sized pieces. In a large mixing bowl, mix together chicken, yogurt, ginger, half of the garlic, half of the garam masala, lemon juice and zest, and some salt. Cut tomatoes into small dices. Peel and finely dice onion. Pluck cilantro leaves from stem and finely dice stem. In a large saucepan, sauté onion, remainder of garlic, chopped chili, and cilantro stems in vegetable oil over high heat for approx. 1 min. Then, add diced tomato, remainder of garam masala, and continue to cook for another 3 min. Transfer marinated chicken to a parchment-lined baking sheet and bake in preheated oven 180°C/390°F for approx. 15 min. until golden brown. In a separate large saucepan, add rice, water, and salt. Bring to a boil, cover, reduce heat to low, and cook for approx. 12 – 14 min. until rice is tender and has absorbed all the liquid. Add cream and bouillon to first pan, bring to a boil for approx. 1 – 2 min., reduce heat, and continue to cook for another 10 min. Add baked chicken to pan and stir well to incorporate. 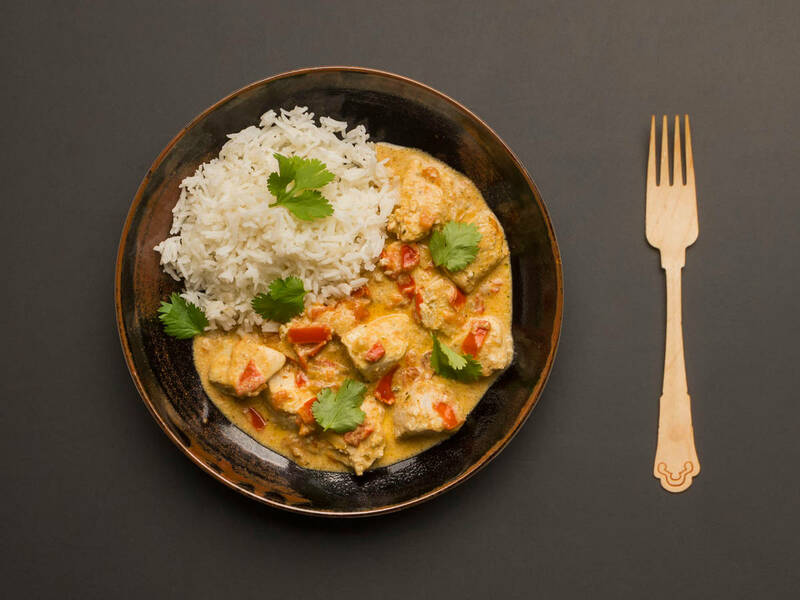 Transfer rice to a serving plate, ladle lemon chicken tikka masala on top, and garnish with cilantro leaves. Kochhaus wishes you happy cooking!